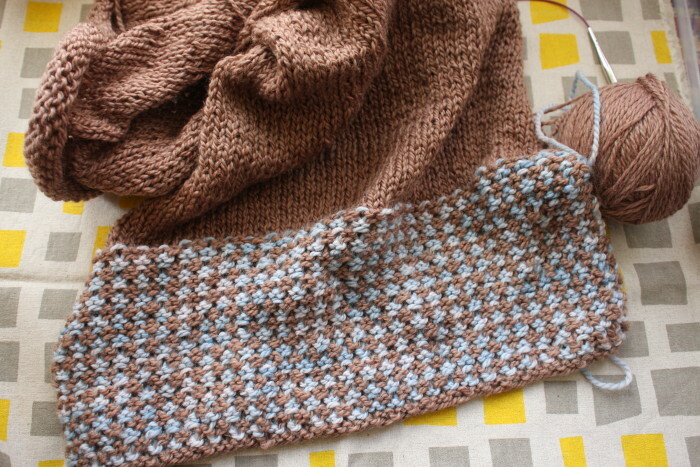 Yes it’s June (though it’s not exactly the hottest June) and I’m knitting an aran weight shrug. However it’s actually a pretty comfortable knit, since it’s knit quite loosely on 7mm needles. I modified the cuff by striping the stitch pattern, and then I decided that I preferred the look of the wrong side, to the right, so I used that side instead when starting the stocking stitch portion. It’s now big enough that I can’t knit it standing up, which is a bit tricky because small people want to sit on me whenever I try to sit down. However it’s proved to be the perfect knit while I work on swapping my knitting style from English to Continental, which I’m doing with the help of Lorilee Beltman’s Craftsy Class*. The yarn, naturally, is OxfordKitchenYarns BFL Aran, in Chocolate Cherry and Cloudy Sky.